Many observers of the free agent market have noticed that this winter has been rather dull. There have been no major signings. The biggest contract so far is the Carlos Santana deal in a move that is questionable. The Phillies gave him a 3 year $60 million deal. Aside from that, most big names are still available. 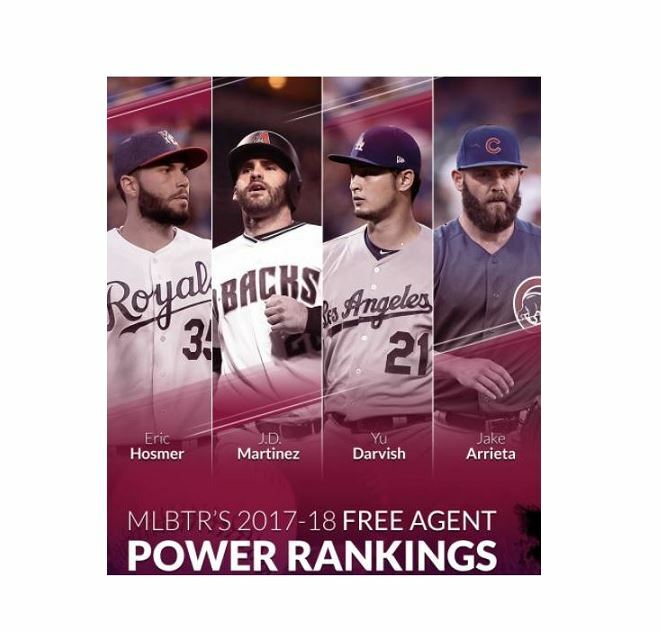 If you look at ESPN’s free agent ranking, you will see that 31 year old Santana was ranked as the fifth best free agent. The Angels signed Zack Cozart to a 3 year $38 million deal. The rest of the top free agent are still available. The next best free agent to be taken was Jhoulys Chacin who was signed by the Brewers and is ranked fourteenth. Let’s be honest, most baseball fans have no idea who Chacin is. True, this list seems flawed. Wade Davis and Greg Holland probably should be much higher. However, the notion is accurate. There haven’t exactly been tons of bidding wars being waged. Teams are playing it very safe. Last year was very similar. If you take away the megadeal Cespedes got from the Mets, it was rather boring too. Encarnacion was the only other player to get a contract that averaged $20 million a year. Fowler, Chapman and Jansen each took 5 years at $80-86 million. Besides that all was quiet on the western front. Yoenis Cespedes signing a 4 year $110 million contract prior to the 2017 season. He is the last player to date to receive this large a contract. There are two things to ask. The first question is why this is happening and the second is will this benefit the Mets? There are several theories why this is happening. The first is that power is not as valued as it once was. In 2017 a total of 6,105 dingers were hit throughout the MLB which shattered the record of 5,693 hit in 2000. The record was close to being broken in 2016 but the players fell just 83 home runs shy. In short, a long ball is really common. Due to this, guys like Jay Bruce, JD Martinez, Todd Frazier, Logan Morrison and Mike Moustakas don’t have the value they would have had a decade ago. This past season 74 players went yard 25 or more times. In 2014 only 27 players did. While power might not be as valuable, pitching must be… right? While that may be true, this year’s pitching pool isn’t turning many heads. Arrieta was the 2015 Cy Young award winner, but he went from great to good in 2016 and then from good to OK in 2017. His stats for Wins, ERA, WHIP, FIP, WAR and K’s have all gone in the wrong direction since 2015. Yu Darvish had a rough World Series and did not pitch well in the first two thirds of the season with the Rangers. Alex Cobb is definitely a good pitcher but his health is always a big question mark. Put this all together and we have a lot of hesitant teams on the mound. After a disastrous World Series, the value of Yu Darvish has diminished. The next reason has to do with the qualifying offer. Teams realize how valuable a draft pick can be. In the past few years alone teams have gotten much better at projecting who will be good in the big leagues. As a result, giving up a draft pick just isn’t that attractive. From the 2015 draft, guys like Swanson, Bregman, Benintendi and Happ all made it to the big leagues and have shown they can play. Guys from the 2014 draft like, Kyle Schwarber, Michael Conforto, Ian Nola, Trea Turner, Matt Chapman, Bradley Zimmer and Brandon Finnegan have all put up solid numbers in their short careers. Toss in other guys like Carlos Rodon, Sean Newcomb, Erick Fedde, Luke Weaver and Jeff Hoffman who have all made it to the majors already and you get the point. Giving up a high pick for a quick fix isn’t that desirable. Michael Conforto- The result of the Mets not signing Drew and giving up a 2014 first round draft pick. Lastly, big signings have a way of not panning out. There are too many examples to list but we all know of megadeals in which a player is guaranteed $100 million or more and he mutates into a goat. With nearly twenty years of data, there is no clear evidence that the stars perform after they sign on the dotted line. Mike Hampton, Matt Kemp, Ryan Howard, Barry Zito, Matt Cain are some of the most glaring examples but there is no shortage of more. This topic requires another post but we all know it. The megadeals have a way of not being all they are cracked up to be and the long term consequences can be huge. Mike Hampton struggled after signing a 7 year contract worth $121 million. So what does this mean for Mets fans? To be honest, this is good. Once January comes around, players start to get nervous. No one wants to turn into Stephen Drew. After a good 2013 season he turned down a qualifying offer and thought he could get a big contract. Instead no team was willing to risk giving up a 2014 first round draft pick (as was stated above) and at the same time, Drew wasn’t willing to drop his price. As a result, he didn’t sign until late May when the draft pick loss expired. Drew’s career never really recovered. This is a ballplayers nightmare. The thought of being left unsigned by opening day and being forgotten is scary. Consequently, someone like Cain, Moustakas, Frazier, Gomez and Austin Jackson are all guys Sandy may consider but he simply won’t put out the big bucks. All it requires is for one to get spooked and Sandy could make a move that won’t break the bank. Next Is There Room for Optimism in 2018?